Ramal shashtra is very easy to understand, even for those who have not dealt with astrology before – you needn’t know any of the scientific jargon involved to be able to profit from our horoscope readings. If we are lucky, though, your interest in this fascinating subject matter has been awakened by one of our short texts. This short online introduction can help make you familiar with most of the Ramal shashtra techniques and give you a basic understanding of how it’s all done. If you wish to learn more about Ramal shashtra, we suggest you contact us. Ramal Shastra is a group of systems, traditions, and beliefs which hold that the relative positions of celestial bodies and related details can provide information about personality, human affairs and other “earthly” matters. A practitioner of Ramal Shastra is called an Ramal Astrologer. Astrologers believe that the movements and positions of celestial bodies either directly influence life on Earth or correspond to events experienced on a human scale. Modern astrologers define Ramal astrology as a symbolic language, an art form, or a form of divination. Despite differences in definitions, a common assumption of astrologers is that celestial placements can aid in the interpretation of past and present events, and in the prediction of the future. Ramal shashtra is a subject of astrology but a huge difference is also there between astrology and Ramal astrology. In astrology we need to calculate every details of planets and zodiacs, with a very deep studies but Ramal astrology need a beautiful set of DICES (Pase) and a complete study and knowledge of These DICES. The DICES we use for Ramal astrology are not actually normal DICES these are specially designed for Ramal astrology. On the DICES there are some specific designs which help us in Ramal astrology readings. 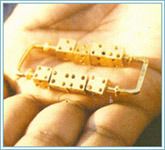 Ramal Dices Can Create or manufacture in a particular Nakshtra or in a good time only.